BACKGROUND: In an ancient papyrus, dating back to 2500 BC, an Egyptian named Imhotep, thought to be the first physician and engineer in history, offers a glimpse into the earliest recorded case of breast cancer. Treatment has evolved over the years, from radical mastectomy to radiation by X-rays, and from adjuvant chemotherapy to hormonal therapy. A key challenge in fighting the war on breast cancer is early diagnosis and here innovative engineers play a vital role. AIMS: While full-field digital mammography has emerged in the past decade, this technique suffers from relatively high dose levels and poor sensitivity when the breasts are dense. We aimed to develop a diagnostic imaging system that exposes the patient to lower ionising radiation and improves the sensitivity and specificity for women with dense breasts. RESULTS: Our PantoScanner platform has been designed to implement slot scanning digital X-rays, thereby lowering the dose and increasing signal-to-noise ratio, while also accommodating automated ultrasound and digital tomosynthesis. Early results based on mammographic phantoms are encouraging while the PantoScanner is undergoing clinical testing prior to commercial release. CONCLUSION: Since breast cancer kills 500 000 people globally every year, early diagnosis by breast screening could save the lives of many women. Our fervent hope is that the PantoScanner system will significantly contribute to this effort in South Africa and around the world. In an ancient Egyptian papyrus, dating back to 2500 BC, Imhotep, thought to be the first physician and engineer in early history, offers us a glimpse into what may have been the earliest recorded case of breast cancer.1 When describing this case under 'Treatment' he suggested, simply: 'There is none'. It would be another 2 000 years before the disease was given a name by Hippocrates who called it karkinos, the Greek word for 'crab', since the swollen blood vessels radiating from a breast tumour resembled the limbs of a crab. In 440 BC, the historian Herodotus tells the story of Atossa, the queen of Persia, who was struck by a malevolent form of cancer, a bleeding lump in her breast. In desperation she persuades a slave to take a knife and excise the tumour. In his prize-winning book The Emperor of All Maladies1 Siddhartha Mukherjee recounts the history of cancer. The author examines cancer with a cellular biologist's precision, a historian's perspective, and a biographer's passion. The result is an astonishingly lucid and eloquent chronicle of a disease humans have lived with - and perished from - for more than 5 000 years. The author challenges readers to a thought experiment: imagine Atossa, the Persian queen, travelling through time, 'appearing and reappearing in one age after the next'. By freezing her tumour in its stage of development and behaviour, Mukherjee asks: 'How has her treatment changed over two-and-a-half millennia and what has been the impact on her length of survival?' From radical mastectomy to radiation by X-rays, and from adjuvant chemotherapy to hormonal therapy, he speculates that, by the late 20th century, Atossa could reasonably expect to live for another 20 years. While the 'war' on breast cancer has yet to be 'won', the future is full of possibility. Ultimately, this is a story of hope, where a key challenge is early diagnosis and this is where innovative engineers have a vital role to play. Mammography allows visualisation of soft-tissue abnormalities and is able to depict subtle calcifications that may be indicative of cancer. Screen-film, however, has several drawbacks: limited dynamic range and contrast, granularity and susceptibility to poor processing of the photographic film. The past decade has seen the emergence of full-field digital mammography (FFDM), which captures an electronic image of the X-rays transmitted through the breast and is steadily replacing analogue mammography.5 The digital mammograms of the left and right breast, in Fig. 1, clearly identify the location of a cancerous tumour. With financial support from the Department of Arts, Culture, Science and Technology, the National Institutes of Health9 and the Industrial Development Corporation, our engineering team set about designing and building a slot scanning digital camera for mammography. We now have a state-of-the-art camera called the Pandia - named after the Greek goddess of brightness - that incorporates advanced attributes. With a pixel size of just 27 microns, the camera captures an image of 94 megapixels and, with a throughput rate of 40 megabytes per second, creates an image that is 188 megabytes in size. The Pandia camera has been tested on a breast phantom where its ability to detect very fine structures indicative of small cancers matches or exceeds all current commercial mammography systems that are based on flat-panel detectors. Who would have thought that a method to catch diamond thieves could impact on our efforts to diagnose breast cancer? Medical ultrasound, in which sound waves 100 - 1 000 times higher in frequency than those detectable by humans are employed to generate images of tissues within the body, has been used in clinical practice to detect breast cancer for over half a century.10 Compared with other imaging modalities such as digital X-rays and magnetic resonance imaging (MRI), ultrasound has several benefits: it is non-invasive, inexpensive, portable and has excellent temporal resolution. The basic principles of ultrasound are simple: a wave is generated by a transducer and propagates through the tissues; the wave is partially reflected at the interface between different tissues; the reflection is detected by the same transducer; and the time of the reflection, plus the speed of sound in the tissue, yields the position of the tissue interface. We have invented a method to combine slot scanning X-rays and automated breast ultrasound in one device called the PantoScanner (Fig. 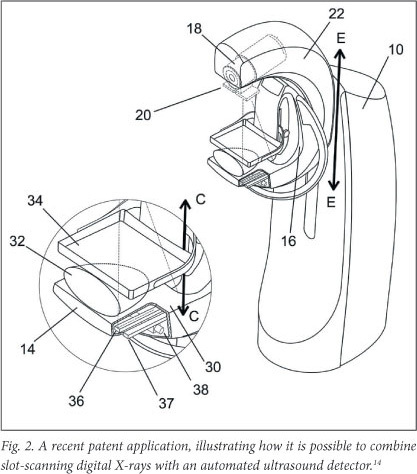 2 - a drawing from our recent patent application14). Our Pandia camera, identified by the number 36, and a custom-designed ultrasound probe (number 37) move in synchrony beneath the breast. The PantoScanner holds the breast stationary with a standard compressor, and can be adjusted for women of different heights, including those in a wheelchair. It then rotates 45 degrees from the vertical to capture mediolateral oblique images of the left and right breasts. Since the ultrasound probe moves beneath the breast platform, three-dimensional (3D) ultrasound images can be acquired in any orientation. A limitation of both screen-film (i.e. 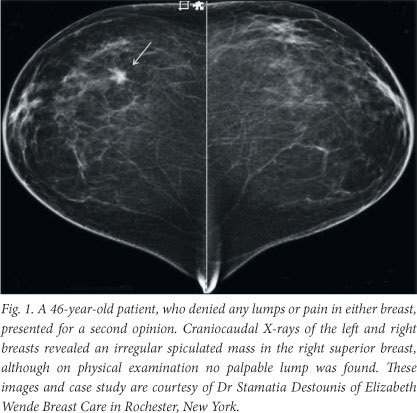 analogue) and digital mammography is that in a standard 2D projection, healthy and pathological tissues often overlap. Cancerous lesions can thus be hidden, particularly when they are embedded in dense surrounding tissues. Digital breast tomosynthesis is a technique in which 10 - 20 projection views over an arc of about 30 degrees are acquired, and then the 3D volume of the breast is reconstructed from the multiple 2D projections using a mathematical algorithm. A benefit of multiple slices of the breast is that the radiologist can view them as an animated video sequence. By focusing on the image, region by region, the cancerous tumour emerges. We have designed our PantoScanner platform so that the tube is able to rotate relative to the breast platform (Fig. 2), so that in the future it can accommodate the acquisition of tomosynthesis images. One of our engineers has also secured a US patent for limited angle tomography.15 Finally, there is the promise of combining 3D X-rays and 3D ultrasound.14 So, is digital breast tomosynthesis a panacea in breast cancer diagnosis? Probably not, but it is a welcome addition to our armamentarium in the war on cancer. In mid-2009 we decided the timing was right to spin our company out from the University of Cape Town. We believed that a company name should have five attributes: linked to our business; enigmatic (i.e. there should be a story behind the name); easy to remember; easy to spell over the telephone (especially to get e-mail addresses correct); and the .com domain name should be available. While we could come up with names that met the first four attributes, the availability of the .com domain proved elusive. It appeared that every word in the English language had been taken by Internet cybersquatters. After testing a few hundred names, we came up with one that met all the criteria: CapeRay. Our logo was designed around a circle, a universal symbol of unity and female power, with our dual-modality concept of X-rays and ultrasound represented by the overlapping arcs and inward facing waves, respectively. Breast cancer diagnosis is an emotive issue and the benefits of breast screening using an advanced imaging technology such as digital mammography have been assumed to be self-evident. However, a recent paper has questioned the conventional wisdom of mammogram breast screening and suggested that the improvements in survival have more likely been due to advances in treatment rather than regular X-ray machine check-ups.16 Soon after appearing in the peer-reviewed scientific literature, it was picked up by lay publications such as the Daily Mail in the UK and women understandably asked themselves: 'Will subjecting myself to breast screening via a mammogram have any impact on my life expectancy?' The American College of Radiology responded to the article regarding the effect of digital mammography screening on breast cancer diagnosis and death rates arguing that while improvements in therapy have played a role in the decrease in breast cancer deaths, therapy cannot cure advanced cancers. Another recent paper17 has shown that in a study of 133 000 Swedish women there was a highly significant decrease in breast cancer mortality for those receiving a regular breast screening mammogram. As Stephen Duffy, a co-author, stated: 'Everyone must make up their own mind, but certainly the combined results from all the screening trials [show that] mammography in women aged 40 to 49 does reduce deaths from breast cancer'. Data from the National Health Service in Britain show that between 1971 and 1987 the mortality rate from breast cancer remained constant while the incidence steadily increased. After screening was introduced in 1988, mortality has steadily decreased, while the incidence has continued to increase. Since breast cancer kills 500 000 people globally every year, early diagnosis by breast screening could save many lives. Our fervent hope is that the PantoScanner system will make a significant contribution to this effort, in South Africa and around the world.